UPDATED 1:15 P.M. EDT U.S.A. It has happened in previous cases involving alleged violations of federal securities laws, and now it’s happening with Traffic Monsoon. “The Peiffer Rosca Wolf law firm is investigating Traffic Monsoon, LLC and Charles Scoville’s alleged Ponzi scheme on behalf of investors – whom Traffic Monsoon called ‘members,'” the firm said in a PR release today. How the firm would proceed is unclear. The announcement, however, potentially means Traffic Monsoon and Scoville will be facing litigation on a front separate from the Ponzi case filed by the SEC on July 26. After the 2008 AdSurfDaily Ponzi case was filed by the U.S. Secret Service, private attorneys filed a racketeering complaint against ASD operator Andy Bowdoin (and others) that helped out a second Ponzi scheme known as AdViewGlobal. Class-action attorneys also filed complaints in the TelexFree and Zeek Ponzi- and pyramid cases. Certain TelexFree-related actions alleged racketeering and referenced a “program” similar to Traffic Monsoon: My AdvertisingPays. There also were counts of fraud against TelexFree principals and some individual promoters. Even if they don’t result in a recovery, the actions filed by private individuals — as opposed to government plaintiffs — force defendants to confront litigation on multiple fronts. Defense costs may soar. “The Peiffer Rosca Wolf lawyers are preparing to take action and seek compensation on behalf of those who invested in the alleged Ponzi scheme orchestrated by Traffic Monsoon and Scoville,” the firm said. Traffic Monsoon gathered at least $207 million, according to the SEC. A note of caution to the TM members. While this may sound like a good idea at first, do not join. It is the job of the appointed Receiver to return money to the true victims of TM. While the Receiver has control of all of TM’s assets, I fully expect the Receiver to do clawbacks just like the Zeek Receiver has done. This is going to take a long, long time to complete. In the Zeek case, there were several class action lawsuits that tried to go forward but the court disallowed them until the Receiver had completed his job and filed his final report. There is no doubt the same thing will happen here. Remember it has taken 2 years for the Receiver in the Zeek case and it is still not done. When you have net winners that don’t want to give up their ill-gotten gains, it takes longer to get that money back from them. I realize that there are many people who are really suffering right now and want a quick fix. Sadly that is not going to happen. Let the Receiver do her job and cooperate with the Receiver and it will take less time to finalize. Don’t fall for the hype not to work with the Receiver. If in doubt, ask those in ASD Cash Generator how that worked out for them. They lost out totally while those who did file a claim got 100% of their money back. Lynndel “Lynn” Edgington: I realize that there are many people who are really suffering right now and want a quick fix. well, they could go after whoever sucked them into this scam. Whi8p while so true, many won’t because it was either a close friend or family member who conned them into joining. Then you have the ability to collect when you win your case. As with most Ponzi’s, the person referring them has already spent all the money, so nothing to collect. The only ones I see having a chance at this would be those who were in the downline of the major promoters, and they should definitely sue them. Then the major promoters will do all they can to intimidate them into not suing them with the old line you should have never invested more than you could afford to lose BS mantra. Well Charles now has an attorney. He hired a CRIMINAL attorney to represent him in the SEC CIVIL case. Every astute businessman hires a CRIMINAL attorney to handle a CIVIL business case. LOL! I just love it when they keep digging their hole deeper and deeper. 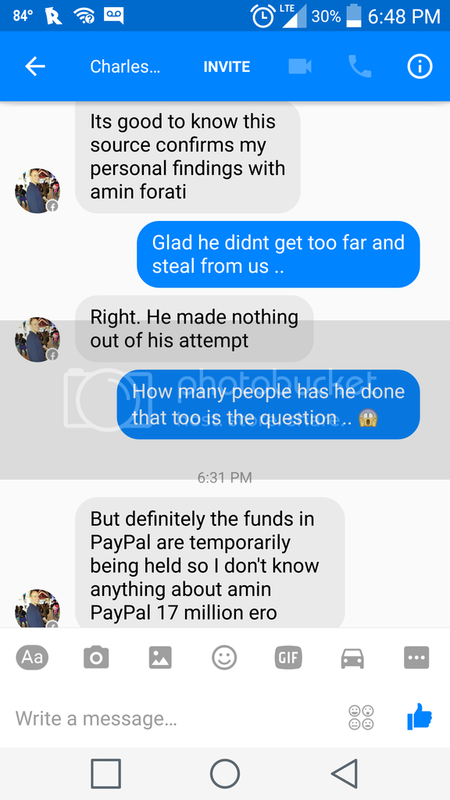 You should also investigate on Amin Forati of D&B Groups in Dubai because for a certain period he was Traffic Monsoon CFO and these founds, beside Scoville indications, were on Amin Forati paypal account. Money always leaves a trace and you should be able to obtain statments from Paypal and have concrete evidences. Amin Forati and his D&B Groups is part of the Traffic Monsoon scheme and it seems he created a mask to “protect” activities that generate money. From partner in satellites business to CFO of Traffic Monsoon?? Amin Forati (ex TM Ceo) with his D&B Group is the key of operation. through his immediate family !!! Dubai and Amin Forati is the financial hub!!! Dr.Amin Abbas Forati President of D&B Group was CFO of Traffic Monsoon (not Ceo) and as CFO Forati was the financial manipulator during Traffic Monsoon sunset and its funds polveritation. On Sept 2015 it was announced by Swiss Space Systems (Holding) the signature of a major investment and partnership agreement with D&B Group to open an S3 Middle-East subsidiary to develop access to Space from the Middle East. Where do you think investments came from?? D&B in Dubai has not even a proper office but just a rental office like Regus. It is all a facade.